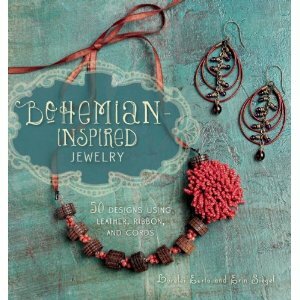 Maybe you're not exactly sure what Bohemian-Inspired Jewelry is, but I'll bet you know it when you see it! Think fun, think a mix of organic materials and great textures, think ribbons, cords, and other very cool fibers. And then think about Lorelei Eurto and Erin Siegel. Both authors are well-known for this style, and thus are the perfect duo to put this wonderful book together for Interweave Press. Plus, they've called upon the talents of 3 more marvelous contributing artists. Fifty projects, folks! And all of them are attainable by people of any skill level: the techniques are simple, but the results are outstanding. Do you like to make pieces using the exact materials as in the instructions? You'll be in heaven then, as there is a complete resource list in the back. Do you prefer to merely be inspired by your books? No problem! The directions give you measurements and generic sizes/shapes so that you can easily make substitutions to suit your own favorite style and palette. There's a terrific guide section in the front which tells you how to choose and care for different ribbons, cords, and fibers. The introduction also covers the specialty findings that you'll need to purchase or to make when working with fibers. Fibers and beads together...it just doesn't get much better. One of my favorite projects is by Lorelei and is a bracelet called Garden Graces (found on page 60). It features kimono cord, something I'd not thought of using. One of my favorites by Erin is a lariat called Afternoon Tea (page 76), which juxtaposes the rustic with the feminine. There's a lot to love in this new book!